Away games in football are awesome! There’s something adventurous about it: new city, new stadium, a slightly different vibe. I love it. As a technical evangelist for Combell, I tend to travel quite a bit and I get to visit cities that have great football teams. I’ve been going to conferences abroad for almost 10 years now and I always told myself that one day I would see a Premier League game or a high profile Champions League game. But I never did, until 2015. 4 Away games in 2015? Challenge accepted! A lot of people grew up with football, played it when they were a kid and spent a lot of time watching games on the telly. I’m not that kind of guy. I had to learn to appreciate the game of football. As a kid I was never into football. But in high school I started to support Club Brugge a bit and even watched some Champions League games on TV. EA Sports FIFA was the catalyst: I started playing the game in 1994 and I was hooked. My favorite edition back in the day was. I learned all about the teams, the stadiums and the squads. And that allowed me to have conversations about football where I could perfectly blend in. Over the years the FIFA game is become some realistic that real football teams use player states for scouting purposes. Not having played competitive football in real life, I definitely lack experience regarding the game itself. Some people think I’m a football expert and that is absolutely not true. 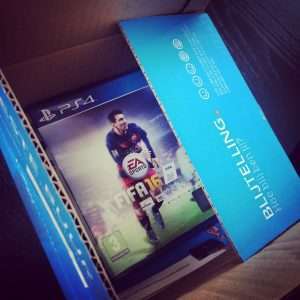 I just know FIFA quite well. Later on, the teams and squads caught my interest and eventually I started watching football on TV. 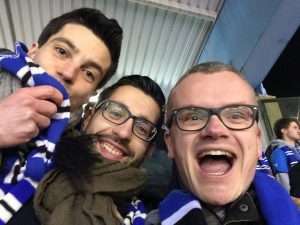 In the mid-2000’s I started attending Club Brugge games and now I’m a season ticket holder. You watch these amazing football games on TV, read about the star players and you want to see this in real life. The first time I pulled it off was in 2010 when I was invited to speak at the PHP Barcelona Conference. I went to see Barcelona at Camp Nou starring Lionel Messi. Loved it, went back the next year. Away games in 2015? Challenge accepted! Based on that motto I told myself I would try to attend as many games as I could while I was abroad for work. It’s safe to say it was a wonderful experience and I’ll definitely try to watch more games when I’m out on the road. It will come as no surprise when I tell you I took quite a lot of pictures, made some video footage and even took some selfies. The video below is a summary of those 5 games. They include all the goals, but also some footage I took before, during and after the game. Hope you like the video, share it, comment on it, like it. Although the game was hosted in Belgium, I still consider it an away game. It was the Belgian Cup Final on March 22nd 2015. The game was hosted on neutral ground at the Koning Boudewijnstadion. Club Brugge versus Anderlecht isn’t just a game, it’s a hate game, just like Manchester versus Liverpool or Arsenal versus Tottenham. Anderlecht are our eternal rivals and playing the in the cup final brings a lot of extra excitement. The game was awesome, the atmosphere was brilliant and so was the result. There was drama involved though. We got ahead early on with a goal by Tom De Sutter. But in the 89th minute Anderlecht drew equal. But finally, in the 92nd minute, seconds before the end, Lior Refaelov scored the winner. We finally got the silverware we had waited so long for. On April 8th 2015, I had to travel to Paris to attend the Git Merge conference. I was waiting for the Thalys train to depart and I quickly decided to check if Paris Saint-Germain played a home game. They did! That same night! It was the semi-final of the Coupe de France. 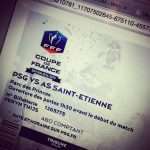 PSG had to play Saint-Etienne. I managed to book tickets while still in the train. Great start to the trip with this away game. 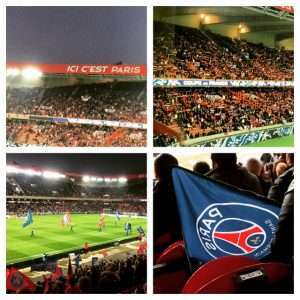 I took the metro, followed the crowd and went to Parc des Princes. To my surprise, the stadium was located in a quite busy area: a mixture of commercial and residential buildings. And yes, it was very busy. The game was great, the crowd was quite vocal and they really had a sense of pride. The “ici c’est Paris” slogan is quite cool! I really wanted to see Zlatan Ibrahimovic in action and I did. He didn’t disappoint and scored a hattrick. He opened the score with a penalty kick. Later on, Saint-Etienne drew equal. After that, Ezequiel Lavezzi scored and Zlatan sealed the deal with 2 more goals. One of which was brilliant. Just have a look at the video above and see for yourself. That very same month I was in Barcelona, on family trip. 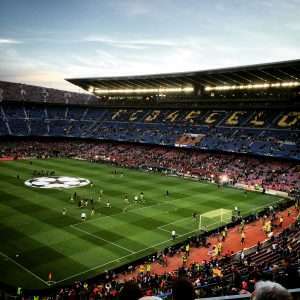 There was definitely some away game action there: a Champions League quarter final game between FC Barcelona and Paris Saint-Germain. 2 teams that could really win it. I managed to buy tickets when they went on public sale. Spent 125 EUR on it, which is a bit steep. But I was expecting an epic game and was willing to spend some money on that. I got the tickets well in advance for the return leg of the knock-out stage. Little did I know that Barça would do a number on PSG in Paris. The first leg ended 1-3 to Barcelona. That meant PSG had to bring their A-game. They didn’t, unfortunately and after a bit over a half hour Neymar had already scored twice. PSG didn’t believe in it any more, Barça dropped the tempo and GAME OVER !!! Was it worth 125 EUR? No, not really, but Camp Nou is still a brilliant stadium and at least I could enjoy the stadium. An away game I will remember! And I managed to see El Tridente (AKA MSN) in action: Messi, Suarez & Neymar. FC Barcelona ended up winning the Champions League, which comes as no surprise. June 7th 2015. I was traveling to Paris to attend the dotScale conference on Monday. 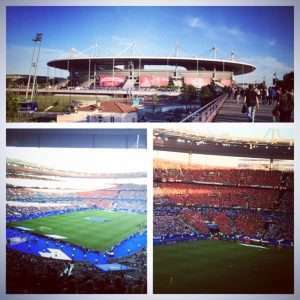 It was a sunny Sunday night and France played an international friendly against Belgium. Wow! Finally a chance to see the Belgian Red Devils. And it was an away game, which made it even more exciting. The Stade de France looks great, really happy I could visit it. I didn’t expect the game to be that special. Friendlies are often that way. But boy, was I wrong! Marouane Fellaini scored 2 goals in the first half. After the break Radja Nainggolan extended the score to 0-3. Mathieu Valbuena made it 1-3 on a penalty kick and only one minute later Eden Hazard made it 1-4 also on penalty kick. After that, Belgian dropped the tempo and Les Blues managed to score 2 goals, making the end result 3-4. Lots of goals, nice weather, great stadium and a legion of Belgian supporters. Massive away game! I went with the latter, because the City game was during the conference.That’d be tough to justify. 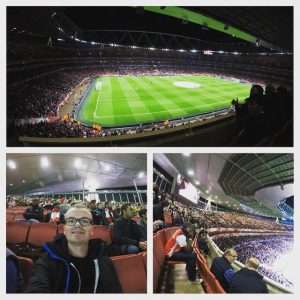 Safe to say I was really stoked to finally go to The Emirates Stadium. I walked around it many times in the past and now I finally managed to get some tickets. The Emirates is the nicest stadium I’ve been to, no doubt. But the Arsenal fans were a bit disappointing. There wasn’t much going on, not a lot of chants, very quiet and they lost the game 2-3 ! I did see some goals by Theo Walcott and Alexis Sanchez. That got the crow on their feet. I was sitting right above the Olympiacos fans and they were having the time of their lives! Constantly chanting and rightfully so! It was a decent away game, with a fair result.